Accelerated 2-Day Hiring Process for Motivated Police Officer Candidates! Are you excited about the opportunity to become a police officer and interested in fast-tracking the testing process? We are offering a condensed 2-day test for police officer applicants next week! During the month of April 2018, City of Fremont Police and Human Resources staff are taking our hiring process on the road to the Sacramento area. Staff will be holding a condensed testing opportunity for police officer applicants who want to take the written test, physical agility test, oral board and even start the background process, all in less than 2-days. This is an open test to all applicants over the age of 20.5. There are no costs associated. Applicants must pre-register and apply by following the instructions below. Schedule - all April dates are in the Sacramento area and open to all. Already have a passing written test (PELLETB or NTN) score? We have an option for that! 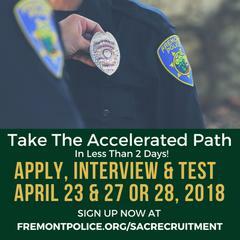 Learn more about the the Fremont Police Officer Condensed Testing Process and sign up online at www.fremontpolice.org/SacRecruitment. Contact Us! Have questions or want more information? Contact Recruitment Officer Mike Gilfoy at Mgilfoy@Fremont.gov.